For over 8,000 years, people have harvested agaves for food, beverage, and fiber. Although the plants have been used continuously in Mexico, the cultivation and culture of agave faded from what is now Arizona by the 16th century. 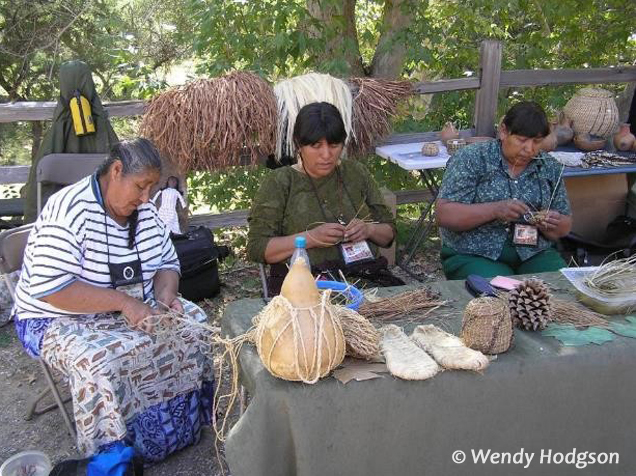 Pai artisans work with fiber from Agave deserti. Starting in the 1980s, University of Arizona archeologists Drs. Suzanne and Paul Fish have documented extensive agave fields near Marana, north of Tucson. Rows of rocks along contour lines slowed runoff across the fields and rock mulch piles reduced evaporation. Near the fields, archaeologists have found knives, for removing leaves, and roasting pits where agave stems, or “heads,” were baked to sweetness. In Cascabel, Sobaipuri agave fields dot benches above the San Pedro River. In the late 1990s, Bill Doelle and coworkers, with the nonprofit Archaeology Southwest, mapped agave fields along 60 miles of the San Pedro River. The archaeologists found a few living agaves in the field; fortunately, they noted and photographed the plants. One of the photos appeared in the 2012 book Migrants and Mounds. Someone showed the photo to Wendy Hodgson, agave expert at the Desert Botanical Garden (DBG) in Phoenix. The plant in the photo didn’t look like any known species. Wendy and her colleague Andrew Salywon went to the fields for a closer look. 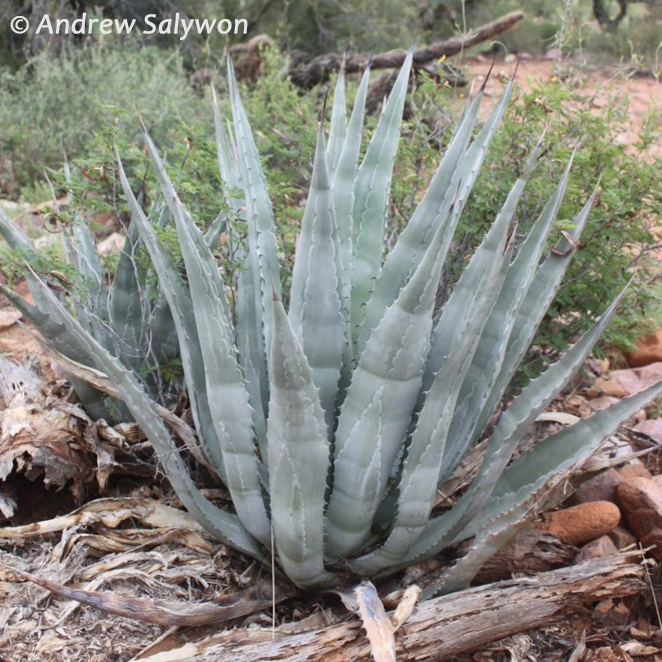 They found a new species of agave, which they named Agave sanpedroensis. We contacted Wendy, who was eager to visit Cascabel. In January 2019, she told a packed Cascabel Community Center about the eight (and counting) species of formerly cultivated agaves she and her colleagues have found. In February, dozens of people braved blustery weather on a follow-up field trip. Wendy explained how she recognizes the different species of agaves and outlined how we can help her survey the plants in our valley. The plants we see today are genetically identical to those the Sobaipuri and other groups developed to suit their needs. Unlike their wild relatives, these cultivated agaves produce little or no seed. Instead, the plants reproduce vegetatively, usually by pupping, to produce offspring identical to the parent. Cultivated agaves are also sweeter than their wild relatives and their leaves are easier to cut. After surviving drought, insects, and rodents for centuries–or millennia–climate change and development threaten these rare plants. As cultivated crops, they fall into a protection gap: the Endangered Species Act protects only wild species and the Archaeological Resources Protection Act protects only inanimate artifacts. Wendy fears that these recently discovered, living storehouses of information on people, culture, and plants could be lost. We’re working with Wendy and the Cascabel Conservation Association to find and protect these unique plants. Two of the 30 bats in Arizona are nectar-feeders and both visit Cascabel: the lesser long-nosed bat and the Mexican long-tongued bat. The bats pollinate night-blooming flowers atop agave stalks and columnar cacti in exchange for a nectar meal. These pollinators move with the blooms from Mexico in winter to the southern U.S. in summer. Bats are threatened by climate change and the loss of agaves to land clearing, development, and harvest of wild plants for agave liquor. The Borderlands Restoration Network (BRN), in Patagonia, AZ, works with partners to protect bats by increasing their agave food supply. BRN and volunteers track the effects of climate change on native agaves through the USA National Phenology Network's Flowers for Bats campaign. Many plants bloom earlier as our climate warms. If bats migrate at their usual time, but agaves bloom earlier, the bats might have nothing to eat. Each year, BRN grows thousands of agaves for planting by landowners as part of Bat Conservation International's Agaves for Bats. Sweetwater Center board member Francesca Claverie makes this all happen as BRN's Nursery Manager.